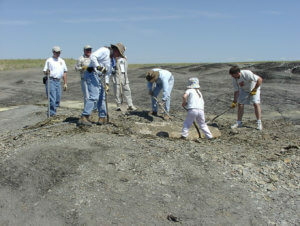 The Paleon’s fossils are collected within Wyoming, and are collected by Paleon staff, members, and guests (paleo-vacationers). There are six major areas currently explored and developed by the Paleon; each has its own rock formation formed at distinct times and with characteristics different from the others. The Lance formation is common in the immediate vicinity of Glenrock, with exposures just north of the North Platte River. Lance dates to 65.5 MYA (million years ago), right at the very end of the Upper Cretaceous Period. Very Common in Lance are Triceratops, Edmontosaurus, and T. Rex. Evidence of all of which have been found and are on display in our Museum. 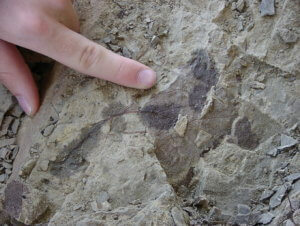 Other fossils from this formation include tortoises, fish, small mammals, crocodiles, lizards, and fresh water mollusks. 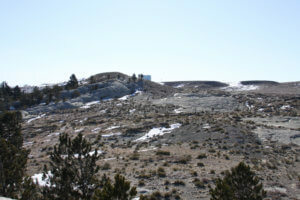 The Paleon has access to a private ranch where there are several quarries, each yielding different examples of Upper Cretaceous animals (and occasionally plants as well). There are sites with concentrations of Triceratops frill and bones, sites with collections of large dinosaur bones (probably stream collections), ‘micro-sites’ with concentrations of small fossils and stream deposited teeth (gar scales, crocodile teeth, mammal teeth, shells, with occasional large dinosaur teeth), and large areas of sparse but common individual bone exposures. Right in the town of Glenrock, on city owned property, is an exposure of Fox Hills formation. This layer was created before the Lance formation when Glenrock was near the shoreline of a large inland sea. Sharks teeth can easily be found in this formation along with the occasional fish vertebra and bone. This formation includes a strata that contains the trace fossils interpreted as tunnels of marine animals. 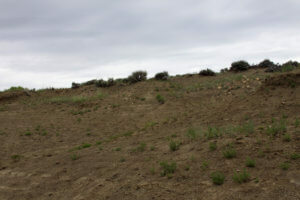 The Cody formation is a very common exposure around Glenrock, appearing as large nearly level expanses draining into the Platte.This formation was formed well before the Fox Hills, when the Glenrock area was between 700 and 1000 feet under water – far from the shore of an inland sea. Fossils from sites in Cody produce ammonites, baculites, clams, and very occasionally marine reptile skeletons. Occurring between Fox Hills and Cody, the Pierre Shale formation is exclusively marine. 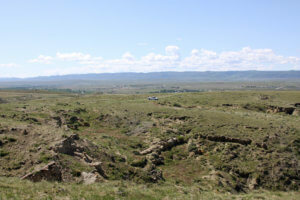 It is exposed north of the town of Lusk, near Black Hills, about 60 miles east of Glenrock, where the Paleon has a quarry. Various fish skeletons have been recovered there, as well as a new specie of Plesiosaur. The Morrison formation was laid down in the late Jurassic, about 144 MYA. Dinosaurs recovered from this strata include Allosaurus, Apatosaurus, and Stegosaurus. The site used by the Paleon is the world famous Como Bluffs, where Marsh and Cope did most of their collecting (and fighting) in the late 1800s. Their finds supplied most of the major world museums with dinosaur skeletons. Much later than the previous strata, the White River was formed about 33 MYA. It is an excellent source of mammal fossils. Camel (yes, right here in Wyoming), Oreodont, and turtle skeletons, all in very good preservation and surprisingly complete, abound in this easily worked rock. 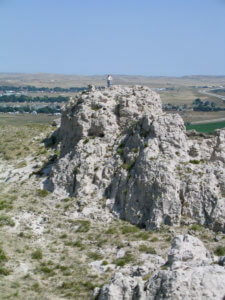 The Paleon’s quarry is near Douglas, Wyoming, about 20 miles east of Glenrock. Other sites are in development, and new sites are always being sought. There are several general types of paleontology sites, each requiring special circumstances to explore and collect from. The Paleon is extremely protective of private property. Staff never explores without permission of the land owner. And if a site appears promising legal arrangements must be made before any collecting is attempted. Fossils, unlike archaeological finds (remains of humans or human ancestors, or human activities), are the property of the private land owner, to do with as the land owner pleases. The most common arrangement between museums and land owners is one where if the museum finds, extracts, and prepares the fossil (sometimes taking thousands of hours of work), then the owner will donate the fossil to the museum. To collect from these sources requires specific permission and paper work beforehand from the governing agency. Most importantly, in Wyoming the collector has the sole responsibility to know where he or she is (private, state, or federal lands), what he is collecting (vertebrate or not), and the current laws addressing such actions.